We are super excited about catching up with the amazing Skylar Caitlin with Chancey Charm about all things wedding planning! Skylar is the incredible Wedding Planner and Designer at the lead of the Houston Chancey Charm location. She discovered she wanted to be a wedding planner when she was sitting in her Senior AP English class with a friend who had the same dream. Skylar enrolled in the Hospitality Management program at Auburn and discovered her love for events was so much more than a whim. Flowers or Chocolate? Can I pick both? Dark chocolate and gorgeous blooms are a match made in Instagram heaven. Dogs or Cats? Dogs, 100%. I’m constantly lobbying my husband, Matt, for a four-legged baby. Winter or Summer? Summer! I prefer sunshine and the beach to snow shoes and hot chocolate. If you could only have one food for the rest of your life, what would it be? A tie between bread and cheese. Oh, and macarons! What would you say is the MOST important reason to hire a wedding planner? Having an advocate who’s been there. A planner can use their experience to provide you with a stress-free – or at least stress-reduced – planning process. Planners can recommend a tried-and-true team of vendors who will professional execute your vision within your budget. Planners can offer up design ideas that speak to who you are as a couple. And planners can handle all the little fires on your wedding day that you’ll never know even happened! What’s cool about the Chancey Charm team is that we can draw on the experience of planner across 13 different locations to provide our couples with the best information possible. When should a bride hire a planner? I suggest booking your full-service planner 10+ months before your wedding, with 12 months being the optimum selection time. For a coordinator, this can be a little looser with many booking anywhere for 4 to 12 months before their big day. One of the perks of being a Chancey Charm coordination client is that you get access to our online planning program from the day you book us. Meaning you get the same planning checklist and processes we use with our full-service brides at your fingertips throughout the planning process. Budgets. Where should a couple even begin? I could write an entire post about just this! Tell us a little about your own wedding (colors, florals, food). What was your favorite part of planning your own wedding? As cheesy as it may sound, my wedding day was magical. Not because of the colors, florals, or food – although I’ll totally dish on that is a second – but because of how calm and sure I felt about making this huge commitment to the man I adore most in the whole world. It was such a blessing to have all of our friends and family near to witness that moment. Okay, now for the part you really want to know… Colors: dusty blue, grey, navy, gold, silver, and a bridal blush. Florals: Sweetpeas for my birthday month, Thistle for my Scottish heritage, Anemones just because they’re so pretty, and lots of dreamy greenery! Food: Family Style! We love dinner parties so passing food around the table was an experience we wanted to bring into our wedding day. Matt’s one request for the menu was Mac and cheese and everyone gobbled it up! Planning as a planner is no joke. You feel like the pressure is on to have the most gorgeous, most organized, most perfectly perfect day ever which really just isn’t reasonable. So our favorite part was planning our ceremony. It was super personal and meaningful to whom we are as a couple. It was a time when I didn’t have to stress over how something looked and actually got to dive in deep to what the day was all about. That’s a wrap! We hope you’re even more excited about your own wedding planning process after learning more about Skylar and her Wedding Planning tips! We are so excited to share one of the most gorgeous weddings with you between two of the kindest souls we’ve had the pleasure of working with. From the moment we met Laith and Kathleen, we knew there was something special about them. But before we get too far into their beautiful wedding details, we just HAVE to tell you how sweet their proposal was, especially because Christmas proposals are extra magical. Right before Christmas, Laith told Kathleen his parents were throwing a holiday party, so, Kathleen made her way to their house to help setup. As she was on her way, Laith called her and said he needed to get out of the house for a little bit because his parents were driving him a little bit crazy. He suggested they both go to a bar at the The Woodlands Waterway and grab a drink before heading back to the party. They started walking back to the car when Laith asked if they could go take a picture down by the water since it was all lit up for Christmas (and if you have ever been along the waterway at Christmastime, you know it is truly magical!). Kathleen had a feeling something was up at this point because Laith is never the first person to suggest a picture. They walked down to the waterway and Kathleen saw a photographer and made a joke that there was already a photographer there for their picture! Little did she know, he actually WAS there for them. Laith pulled her around, got down on one knee and asked Kathleen to spend forever with him. As we’re sure you’ve guessed, she said YES! Spending time with these two and getting to know them both individually and as a couple has been such a true joy. The details of their wedding were soft, beautiful and timeless. Laith’s bolo bowtie and we’re pretty sure you will to! Kathleen’s Prada Shoes! Alllllll the texture and gorgeous! Serious, perfection. Every single floral. Not only were the white wedding bouquets and centerpieces absolutely gorgeous, they were literally made with love! Kathleen’s aunt designed and created all the florals for the day. And last but not least, Becki’s personal favorite thing from the day, Kathleen’s two piece dress from Brickhouse Bridal. It was feminine and detailed — everything you could ask for in the perfect wedding dress! Our inquiry form has a question on it that says “where did you hear about us?”. When we got Shannon’s inquiry after Eric proposed, I think it was the longest note we have ever had written in that section, saying something along the lines of “my brother, my sister, my mom, basically everyone!” which not only made my heart so happy, it was also entirely true. I have known the Geuther family for years, and Ryan has known them even longer. (Shannon’s brother actually knocked out Ryan’s front tooth with a golf ball retriever in the second game while they were throwing around golf balls in the backyard.) All this to say, Shannon and Eric’s are an absolute dream, with a family legacy with the Geuther’s behind them that could only be rivaled but how incredible Eric’s parents are as well. Shannon knew from the very beginning the vision that she had for her Houston wedding day, and she executed it so beautifully. 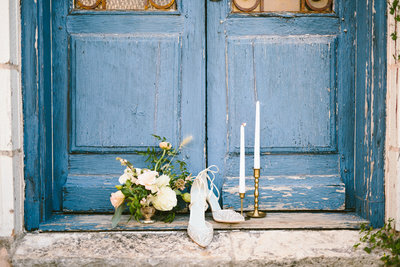 From the gorgeous details (especially her ribbon bridal shoes!) to her almost-too-perfect-dress from Whittington Bridal and classic chignon bridal updo, it was a wedding we won’t soon forget. But you know we love a good proposal story, so let’s go way back before we dive into the wedding day! Eric arranged with Shannon’s parents, brother and sister-in-law to go to the Houstonian for Christmas Eve brunch. Eric proposed to Shannon right in front of the Christmas tree. She couldn’t have been more surprised and it made Christmas even more magical for the two of them. Christmas lights, a gorgeous tree, family AND a proposal?! We love everything about it. Shannon and Eric shared their I Dos at the Second Baptist Church in Houston and we’re still dreaming about the beauty of it, thanks in large part to so many incredible vendors we had the opportunity of working alongside and Shannon and Eric’s wonderful friends and family who attended. The beautiful brick, gorgeous greenery surrounding the windows and the gorgeous archways and white pillars, – such a dream! After the ceremony we made our way to the reception at the Brae Burn Country Club and we immediately fell in love with the classic style and décor Shannon curated for the space. But it wouldn’t have been truly complete without the transition into an epic dance party with a live band, Hawaiian leighs and colorfun sunglasses. We saw some pretty phenomenal dance moves — we definitely took notes. But my absolute favorite part of the day may have been Shannon and Eric’s grand exit. It was truly epic. They were surrounded by all their loved ones holding sparklers and every single person was beyond excited to be sending them off from their celebration (still wearing sunglasses and leis!). It was truly one of the most beautiful moments. Thank you so much, Shannon and Eric for choosing us to photograph your wedding day! We are so thankful for you and can’t wait to see you bust a move as you celebrate your first anniversary at your sister’s wedding next fall at the Bell Tower on 34th! Shannon and Eric’s Creative Team was absolutely a dream to work with. Click Below to see more of their work. Sarah and Thomas had one of the most romantic and beautiful engagement sessions EVER. You know it is impossible to ever have favorites, but this San Antonio engagement session is a top five for sure! We just HAVE to tell you two of our favorite things from their session! First: the location! We photographed Thomas and Sarah’s engagement session at the San Antonio Missions and immediately fell in love with the stunning scenery and textures. And second: the light that day was so incredibly dreamy. Throw an amazing couple in the mix and we photographers have it made! 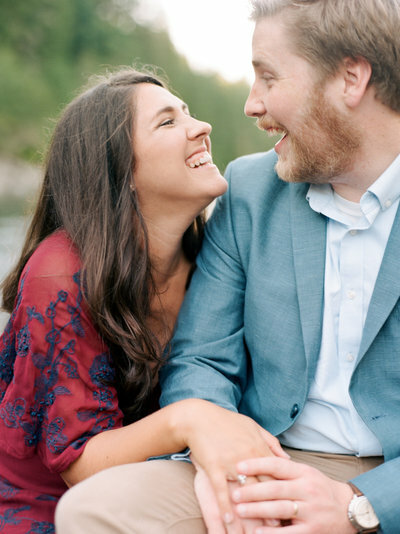 If you can’t tell from their images, Sarah and Thomas are super adorably in love and they truly know how to make each other laugh (but of course, we still threw in a few of Ryan’s hilarious dance moves for good measure). True to Smith House form, we HAVE to share their proposal story. Thomas had been invited to a wedding in Spring Branch and since it was an out-of-town wedding, he asked Sarah if she wanted to go for the whole weekend to spend time with family and to go out on a date night together. Thomas gave Sarah two options, 1: a totally new date, something they had NEVER done before, or 2: to combine her favorite parts of multiple past dates into one epic day date. Sarah chose option number two, the epic favorites date! So Thomas set out planning. They started out with sushi in Austin at their favorite restaurant, followed by a walk around Enchanted Rock where Thomas popped the question on top of the dome! (Of course, him popping the question in the MIDDLE of their date instead of at the end made it even more of a surprise!). The date continued with an engagement celebration dinner in Fredericksburg and a surprise party brunch the next morning with all of their family and closest friends. Ahh, sweet love! We had so much fun getting to know these two and we feel so honored they’ve chosen us to photograph their wedding at Lost Mission this summer. We can’t wait! Before we dive into Tracy and Josh’s outdoor Houston Wedding, we have to tell you their about how they got engaged. Proposal stories are our favorite and it’s impossible to get sick of them. You’ll also learn that we tend to call every single one our favorite… but we aren’t lying! They really are all SO good that we have a new favorite every time we hear a new one! But here is one that just might top the list forever. Josh and Tracy had been planning for a couple months to take Tracy’s mom to their favorite B&B. When they arrived, they were met by the owner who told them their room was undergoing some water work so, they put their things in Tracy’s mom’s room and went to dinner. Josh then asked if they could look in the suitcase because he asked Granny to hide a little surprise in there for them. Both Tracy and her mom were blindfolded and led to their surprise. (It’s important to tell you that Tracy’s mom knew what was happening but played along perfectly! She’s a rockstar like that!) As they were being led to the surprise, Tracy kept thinking Josh set up a special massage or a nice dinner. As Josh held Tracy’s hand, he led her down a path and then Josh whispered “I love you more than anything and you can see the surprise now.” Tracy took off the blindfold and before her were the most beautiful words floating on the pond that said WILL YOU MARRY ME? As Tracy quickly turned around, she found Josh on one knee, asking her to spend the rest of their lives together. With so much excitement, Tracy jumped up and down and said YES, almost falling into the pond in the process. Josh put the ring on Tracy’s finger and held her hand walking back towards the B&B, only to find out there was ANOTHER surprise! Josh turned Tracy around to find a full-blown parade of honking cars; all of their closest friends and family members were there to join them for a celebration! If that isn’t enough to make you teary-eyed, we aren’t sure what is. The sweetness and love Tracy and Josh share together is so contagious and you just can’t help but be so incredibly happy around them. We ended up photographing their rehearsal on our very own Anniversary and Tracy and Josh surprised us with the sweetest, most beautiful custom cookies. They are beyond thoughtful and are constantly loving on others and blessing them in every way. It is so easy to see the impact that they have on their friends and family and we cannot wait to see the legacy they build together. Their wedding day was full of nothing but happiness, tears of joy, hugs and laughter that every single detail was just a bonus. Their floral ceremony arch for their outdoor Houston wedding, their handwritten vows in their calligraphed vow books, Tracy’s Kate Spade bridal shoes, the floral bridesmaids robes, ah the list could go on and on, but I’ll just let you look at the photos! It’s always exciting when you find gems in the most common of places. 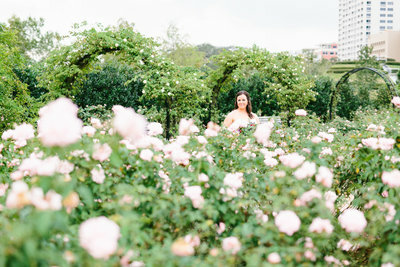 We photographed the first portion of Nick and Danielle’s engagement session at the University of Texas and found the most gorgeous greenhouse, smack dab in the middle of campus. Danielle lived in Austin her ENTIRE LIFE and Nick graduated from UT and neither of them even knew it was there! It is a new favorite place for sure! Just before sunset we hopped in our car and drove up the back curvy roads to beautiful Mount Bonnell. If you have never been, especially at sunset, it is a MUST SEE. The greenery and view overlooking downtown was absolutely breathtaking. Adding Danielle and Nick to the mix just made it even more magical. The sweet looks, the giggles and the laughter, the special unplanned moments, that’s what it’s all about. We couldn’t be more excited to share in photographing Danielle and Nick’s special day. If their engagement session is any indication of how their wedding at the W Hotel in Downtown Austin is going to be this spring, we’re all in for the most wonderful day ever. Before we get into the exciting details of Melba and Josh’s intimate wedding ceremony, we should start with the story of how Josh proposed to Melba. It was Thanksgiving evening and they were baking in the kitchen. Melba’s mom was attempting her very first organic pound cake for Josh (its his favorite, and Melba’s mom LOVES Josh so she was excited to make something especially for him!). The cake went in the oven, and when it came out the only thing better than the delicious smell was how amazing it tasted! They cleaned up and Melba prepared to leave, but Josh wasn’t ready to go quite yet. He stood idle, talking about all of the fun they had that day, and how he “would like the fun to continue…” (Yes, Melba may be the only girl in the world who actually remembers what her fiancé said during his proposal!). At that moment, Josh got on one knee and pulled out a ring box he had been carrying in his shoe the entire day. Right there in the kitchen, with Melba’s mother by his side, Josh asked Melba to marry him!! Her mother screamed and everyone cried! It was the most special day of both their lives. True to our Creative Non-Fiction style, we wanted to capture Melba and Josh’s wedding through their most important details. One thing we love about weddings so much is how unique they are to each couple, and this was especially true with Melba and Josh. When the bride-to-be and groom-to-be began planning, they sat down with all the traditions and completely threw out the ones that they knew weren’t for them. The result was beautiful: an intimate wedding ceremony with just their immediate families at the White Hall Houston, followed by an intimate wedding dinner with just 30 of their closest friends at Brennan’s of Houston. The moments shared were nothing short of remarkable. Everything flowed together so seamlessly and the moments were equally full of laughter and tears of joy. Once Melba and Josh knew that they wanted the foundation of their first day as husband and wife was an intimate wedding ceremony and to be simply surrounded by the people they love, they dove straight into the details, something that Melba absolutely loves. The three most important things were the florals, the cake, and the color palate. The florals came to life exactly in Melba’s vision with Megan of Lanson B. Jones on the team. Megan chose in-season blooms, which included the most beautiful blush garden roses that stole the show in Melba’s bouquet. For dessert, Melba and Josh chose a traditional white wedding cake, surrounded by their absolute favorite dessert of Chocolate Chip cookies and Milk; a dessert combination that was to die for from the amazing Whisk Bakery. And all of this pulled together the soft colors of blush, cream and Navy which Melba and Josh so perfectly selected. They permeated the day from the beautiful floral arrangements, her Mori Lee DRESS, and even their BHLDN vow books. One of Melba’s favorite things about their wedding was Josh’s custom tux made by Limitus Bespoke, which featured silk blush pink lining with gold piping and embroidery detail with their wedding date. He was pretty excited to show it off and we were just as excited to snap portraits of it! Melba and Josh truly planned a day that brought two families together as one. There was laughter and many tears, and it is these moments that we hope their wedding portraits will always bring back the memories of. Those tender moments shared between two people in love and the family and friends that surrounded them. Melba & Josh, your love is infectious in the best way and we are so grateful you invited us to capture it. Melba and Josh’s Creative Team was absolutely a dream to work with. Click Below to see more of their work. When Ryan proposed to me almost FIVE years ago, I didn’t actually hear anything he said. It was a blur of him being down on one knee and a ring box and trees all around. All I really know is that it was the most exciting moment of my life; which seems like a weird thing to say about a moment I barely remember! We called our parents and closest friends, made it Facebook official, and a few weeks later we started talking about the wedding. Oy. Vey. I had NO idea where to even begin. We were doing a lot of googling, a lot of talking around in circles, and a whole lot of NOTHING when it came to actually planning. Eventually, we figured things out, found the perfect venue, and got back to actually enjoying our engagement, but I certainly wish I had a little more help in the beginning stages! So for all you newly-engaged friends out there, we asked some of our favorite wedding vendors a few pieces of advice for getting started, and we hope that it helps you as you dig into wedding planning! Before searching for your venue you’ll need to have a firm grasp on your budget and guest count. It’s never fun falling in love with a venue that can’t accommodate your two main needs. After doing some online research to find the venues that meet your needs then, you should schedule tours at your top 3-5 choices. Pro Tip: When you’ve found “the one” don’t dilly dally around – venues only host one event per day and book quickly, especially during the months of January-March, you’ll need to be prepared to reserve your date. Wedding season in Texas is a little different. Due to our hot summers, the season runs from March through the beginning of June and takes a break until late September where it ramps up for our busiest month of the year – October.” One tip for stretching your budget is planning your wedding for an “on-season.” This is especially helpful for booking your dream venue! Keep one to two ring trees in your house. Keep one in the kitchen so that you can easily take off your ring as you cook or clean. Keep the second tree in your bathroom or bedroom as I don’t recommend you shower or sleep with your diamond. Any soap or residue when you shower will stick to the diamond and only keep it dirty. If you can’t already tell by scrolling through these engagement photos, Caroline and Eric are pure magic; they may even be brighter than the sun. They are truly the sweetest of couples, so of course they also have have the sweetest of proposal stories. Eric proposed to Caroline on her birthday, which in 2017 fell on Easter. They planned to spend the morning with Eric’s family at his sister’s house. She lives across the street, so they walked over together. Along the way Erica had gone out early before Caroline woke up with a basket full of Easter eggs and set up on a blanket under a beautiful old tree in the yard. In the basket, among Caroline’s favorite chocolate bunnies and Easter candies laid a crystal egg with a small box sitting inside of it. Eric got down on one knee and asked Caroline to marry him. When we began planning Caroline and Eric’s engagement session, Caroline knew two things for certain; the first was that she wanted to capture their true joy and the fun they share together everyday and the second, she wanted a timeless, classic engagement portrait in the tree lined streets of Houston. Of course, with how in love these two are and how much they make each other laugh, the first one was easy. And to make the second come to life, we headed to the Houston Museum District filled with the most beautiful oak trees and the gorgeous sunlight shining through. We truly could not have asked for a more beautiful day to share in capturing such beautiful moments with these two lovebirds. Caroline and Eric are getting married next summer at the oldest Catholic Church in Texas, the Historic San Fernando Cathedral in downtown San Antonio, Texas and we cannot wait for their I-Do’s! We don’t have favorites when it comes to weddings, but I think it is safe to say that if we fell into a Groundhog day scenario and had to relive and re-photograph Brooke and Ben’s wedding day over and over again, we would be just fine with it. And I guess our favorite international blog, B. 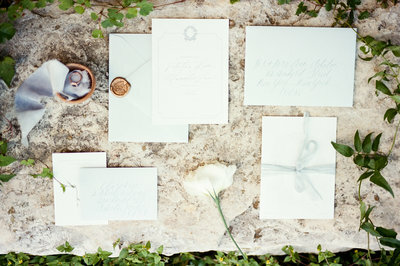 Loved Blog agreed, because they featured Brooke + Ben’s beautiful outdoor Houston wedding today! Brooke & Ben are exceptional human beings. They are kind, humble, and treat each person they meet with the utmost respect. Ryan and I were just a small part of the incredible vendor team they included in their wedding at The Carriage House, and Brooke and Ben treated each of us like a part of their family. We are truly grateful to have captured every moment of their day, and every detail that was so thoughtfully planned. You can see the full feature here and you can scroll down to see some of our favorite images and moments from the day, as well as the incredible vendor team, spearheaded by Houston Wedding Planner, Garnished Event, that made it all happen! We love the outdoor ceremony space at The Carriage House. 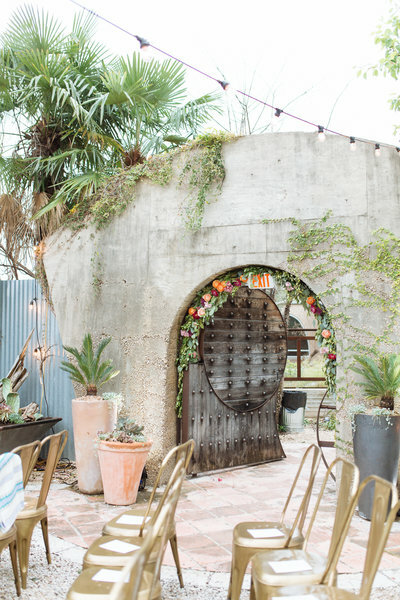 The greenery arch is a staple, which makes your whole ceremony space look lush and beautiful. Cocktail hour included french fries, sliders, and a specialty Bridal Cocktail; all of which is SO Brooke & Ben. Brooke’s grandmother, who was an integral part of the planning process, passed away just a few weeks prior to the wedding. Brooke included some of the sweetest details, including wearing her vintage rings and having a space saved for her at the ceremony. Without a doubt, she was there with us. The Ginger Snap Photo Camper is always a win. And how gorgeous are these greenery and floral church pew arrangements? 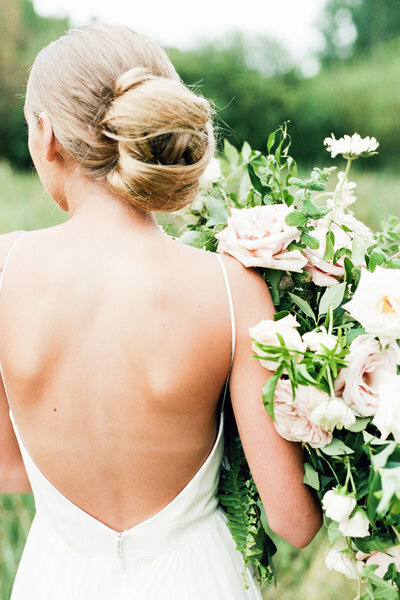 Mary from Gypsy Blooms blew the wedding florals out of the water. Brooke and Ben had a floral hanging installation in their greenery ceremony arch. And the bridal and bridesmaids bouquets were absolutely to die for. And boutonnieres are often overlooked, but these were absolute perfection so I had to include an image of them below!